The last thing you want with our cold Minnesota weather is a cold shower! Water heaters typically have an average life span of 10 to 15 years. If your hot water heater is nearing the end of its life, don’t wait until it’s too late. If your hot water’s running cold or if your tank’s sprung a leak, call Dean’s! 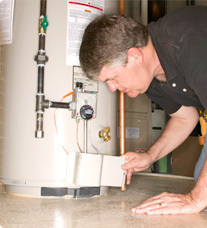 Our experienced repair crew is also trained to service any make or model water heater. With over 35 years of experience working in the Minneapolis, MN metro area, you can trust that we’ll get your hot water heater working in no time.